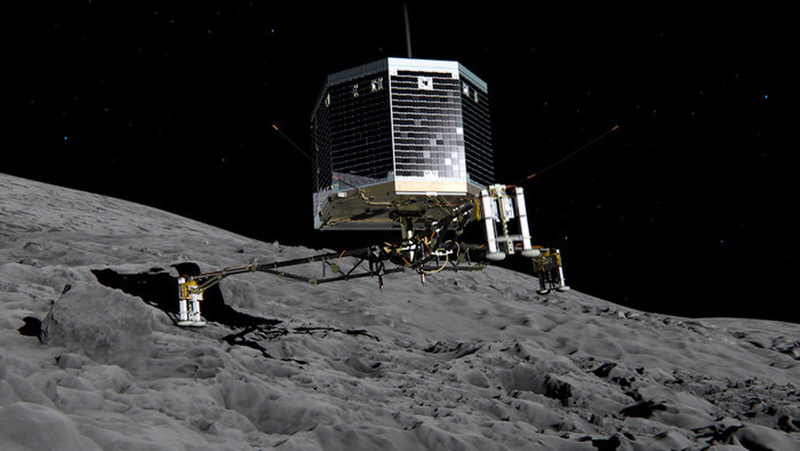 European Space Agency lander probe, Philae which made a historic landing on the comet 67P/Churyumov-Gerasimenko after a decade-long, 6.4 billion-kilometer (4 billion-mile) journey through space aboard its mothership, Rosetta, has finally come to rest in the shadow of a cliff, which is making things difficult for scientists who are looking forward to lots of useful information from it. The shadow is interfering with the working of the lander’s solar panels. Though it had failed to latch on properly to the rocky surface of the comet, it is still stable, said the mission scientist Jean-Pierre Bibring said, adding that it appears to be standing on just two of its three feet but its scientific instruments are operating normally. The gravity on the surface of Comet 67P is 1/100,000th that of Earth, meaning the 100 kgs (220 pound) lander weighs only 1 gram (0.04 ounces) there. “Where we are is not entirely where we wanted to be,” leadlander scientist Jean-Pierre Biebring told a news conference. “Do not put the emphasis on the failures of the system, it is gorgeous where we are now,” added Biebring. Because of being stuck in the shadows, the solar panels of the lander will get only an hour and a half of sunlight a day instead of the expected six to seven hours. At this rate, the batteries will run out on Friday. The probe could try to use its landing gear to hop out of the shadows but ESA will need to know more exactly where it is before attempting the risky maneuver, scientists at the ESA’s space operations center in Darmstadt, Germany, said. Scientists associated with the project hope to unlock details about the birth of planets and the evolution of life on them from the samples drilled by Philae from the comet’s surface. The ice and rock that makes up comets are capable of preserving ancient organic molecules like a time capsule. At present there are doubts regarding the lander’s capability of being able to drill out samples from beneath the surface of the planet. The ESA said even without the drill, the Rosetta mission – which costs about 1.4 billion euros ($1.7 billion) – was relaying groundbreaking data and images. Biebring said scientists would see what could be done to ensure the lander gets enough sun. “We might try to better orientate the solar panels,” he said.